By engaging our VPA, you do not have to worry about trivial business backend chores. Leave these hassles to your VPA to make your valuable time more productive. This could reduce your monthly overhead cost as you do not need to pay your VPA monthly salary, EPF, SOCSO, Bonus, medical leave, annual leave and other fringe benefits. With this, your business could also save on other cost spent on a staff like working space and equipment. 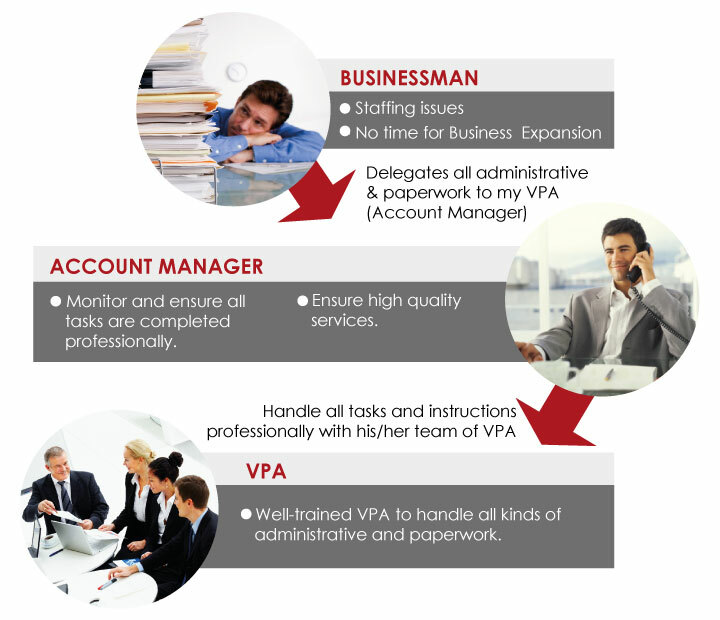 We train each Account Manager and VPA professionally to handle all kinds of administrative and paperwork. Each company has a dedicated Account Manager to manage instructions given by you professionally. The assigned Account Manager will then lead a team of professional VPA to support your business operation thus delivering consistent high quality results. You can be assured that all information and data will be treated in the strictest of confidence. This has been proven to be a very cost effective service because while you run your business, you do not need to worry about staffing issues such as high turnover rate, absenteeism, productivity, inefficiency of staff performance and cost redundancy as we consistently manage your administrative and paperwork without fail. Time in the evenings and weekends should be spent with loved ones and not on business matters. Let us know how you would like to manage your paperwork and leave it to us while you spend time on what matters most to you without any worries.